Among critically ill patients and their surrogates, a family-support intervention delivered by the interprofessional ICU team did not significantly affect the surrogates’ burden of psychological symptoms, according to results of the PARTNER trial. 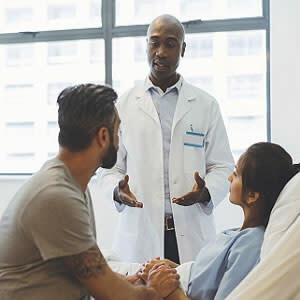 Researchers note, however, that the surrogates’ ratings of the quality of communication and the patient- and family-centredness of care were better and the length of stay in the ICU was shorter with the intervention than with usual care. The multicentre, stepped-wedge, cluster-randomised PARTNER (Pairing Re-engineered ICU Teams with Nurse-Driven Emotional Support and Relationship-Building) trial was conducted by Douglas B. White, MD, Department of Critical Care Medicine, University of Pittsburgh School of Medicine, and colleagues. A total of 1,420 patients with a high risk of death were enrolled in the study; the results are published in The New England Journal of Medicine. Surrogate decision makers for incapacitated, critically ill patients often struggle with decisions related to goals of care. Such decisions cause psychological distress in surrogates and may lead to treatment that does not align with patients’ preferences. Although guidelines from professional societies recommend strategies for supporting the families of critically ill patients, evidence suggests that many families who might benefit from such support do not receive it. For the PARTNER trial, Dr. White and colleagues developed an intervention that is grounded in modern decision theory, to address both the affective and the cognitive challenges that are encountered by surrogate decision makers. This intervention harnessed the competencies and expanded the role of critical care nurses, who received a 12-hour training and then were charged with the following responsibilities: preparing surrogates for physician-led family meetings, attending meetings to make sure essential content was discussed, debriefing with the family after the meetings, and checking in with the family on a daily basis. The results of the PARNER trial "cannot be interpreted as clinically directive but begin to offer us a way forward," according to Dr. Daniela Lamas, who is a pulmonary and critical care specialist at the Brigham & Women's Hospital in Boston and faculty at Harvard Medical School. In an Editorial published in the same journal, Dr. Lamas says that the trial design most likely led to substantial imbalances between the intervention group and the control group. Of note, the intervention group had a shorter mean ICU stay and higher in-hospital mortality than the control group, with the two groups having similar mortality at six months after discharge. "These findings suggest that the intervention did not lead to the premature death of patients who would have otherwise done well — instead, the intervention was associated with a shorter dying process for those who faced a dismal prognosis," Dr. Lamas writes. "We cannot, of course, ask the patients who died whether their outcomes aligned with their wishes, but we know that people have priorities other than extending life as long as possible." The editorial says White et al. 's findings "reflect a profound shift" for critical care, which has historically measured its victories in terms of the number of patients who are living, regardless of what that life looks like. “These new findings offer a harsh reality that complicates the definition of success — it may be possible that providing better care for the most seriously ill patients means that those patients do not live as long,” Dr. Lamas writes. "As we increasingly look beyond mortality as the primary outcome that matters, seeking to maximise quality of life and minimise suffering, this work represents an 'end of the beginning' by suggesting the next steps in moving closer to achieving these goals."